A male jaguar takes a dip in a waterhole to cool off. 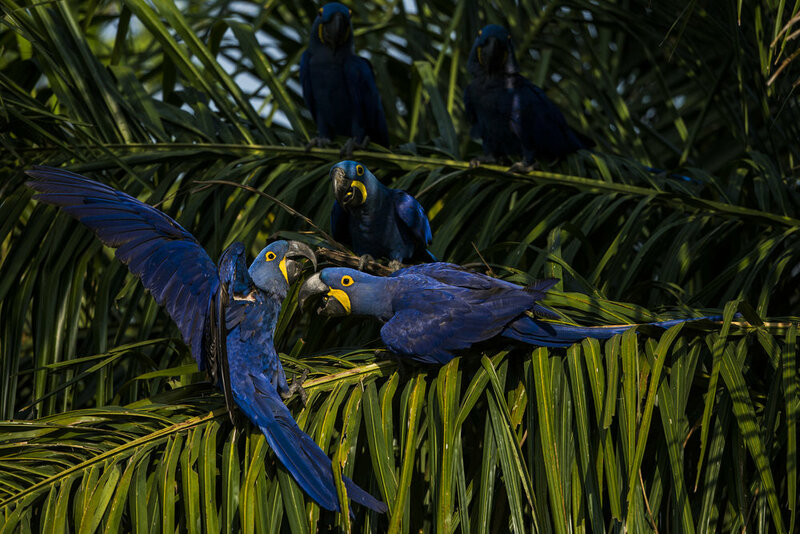 Hyacinth macaws squabble over palm nuts. A jabiru stork stalks the riverbank at dusk. A giant river otter with a plecostomus. A giant anteater takes a drink. Hyacinth macaws fly by at dawn. Jaguar tourism is a huge draw generating millions of dollars per year. A vaquero (cowboy) herds cattle along the Transpantaneira road, the road that bisects the Pantanal. Hundreds of cattle wait at dusk, shrouded by smoke from nearby fires. A cow, miraculously still alive after a jaguar attack.